I was making you some jumbo banana nut muffins because I know how much you like them, but the thing is, I ran out of liners. They got used up on a lamp or something. Or maybe it was giftwrap. I could have just greased the pan but my muffin rack is sort of gross. That was not a pun. My muffin rack is perfectly clean, but you know, it looks rusty in the corners. Is your tetanus shot up to date? You should work on that. Anyway, the bananas were already blackened to mush and they couldn’t wait until the weekend for me to get to the store, so I made do with coffee filters. They worked fine. 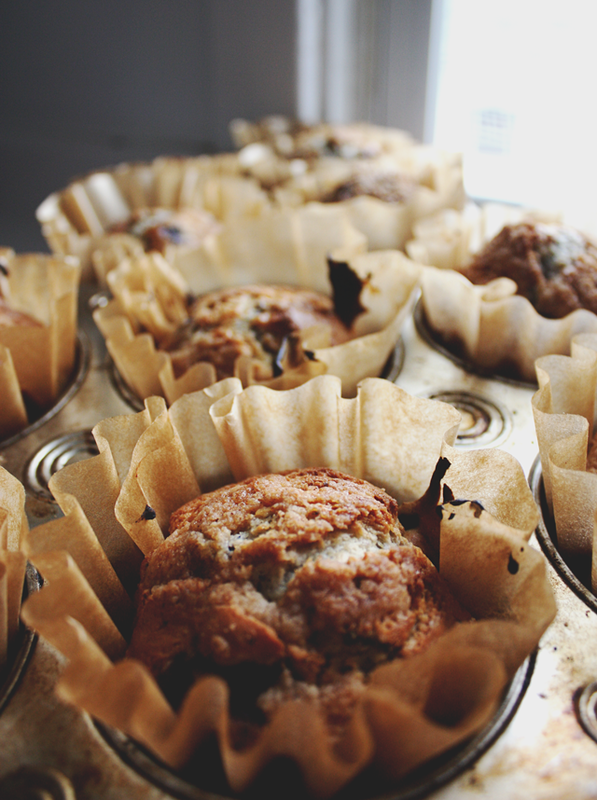 Now your muffins have bananas, nut and ruffled collars. Elizabethan baked goods – you got ‘em. That’s terrific news! I live in a beautiful Mexican beach resort town, but odd things like muffins liners are often impossible to find. We have to be resourceful when it comes to fulfilling recipes from NOB. This is a wonderful resolution to the problem – thanks so much! Very nice, very nice! Some of your club members have decided that you should post some music, as in Surfan or whatever that you mentioned the other day. We would like to broaden our horizons. My favorites are Leonard Cohen and Josh Ritter. Since Leonard is finished with his US tour, I was thinking of going to Paris to see him in June. He may never tour again. Not that you NEED a reason to go to Paris, but THAT is an excellent reason to go to Paris. I have used mini loaf liners in the same capacity. People seemed genuinely puzzled by the ruffle. It’s a ruffle! Enjoy the floofy goodness. Love it Aunt Peaches. I never thought of using coffee filters. Love the unbleached too, gives it that old world feel to it. Oh, that is so fun! Wait, next time you gotta food-color-dye them and then they will be seriously Aunt Peachy. You could write a book on the many uses of coffee filters! What would you do with out paper coffee filters? I shudder to think. Very nice! I’m curious…did you use unbleached coffee filters or did they go from white to “unbleached” in the oven? I was going to use unbleached filters as liners in my mini loaf pan but am afraid that they’ll get REALLY DARK in the oven. They were unbleached / brown before they went in. I didn’t see any change in the oven with white ones.